Stuffing: You either love it or you hate it. Unless, that is, we’re talking cornbread stuffing. Who doesn’t like cornbread? 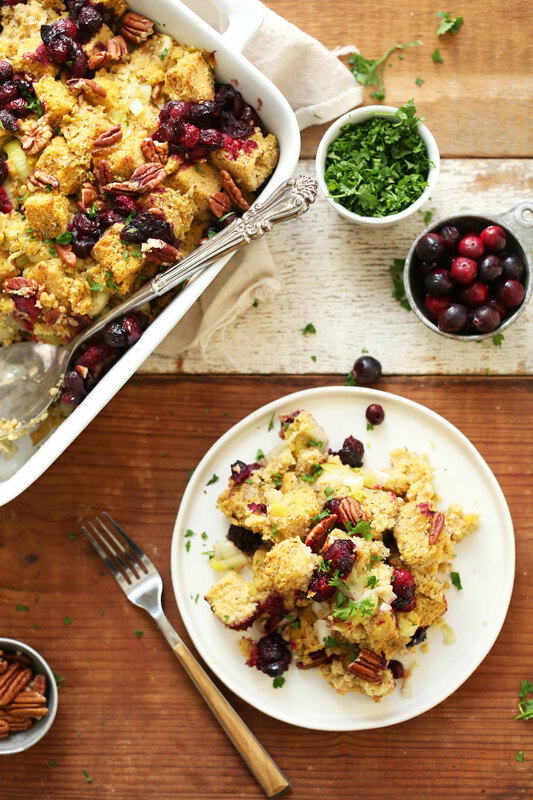 That’s why this hearty, flavorful, 10-ingredient stuffing is the perfect side for your Thanksgiving spread. Can you believe this is the 8th (!!) and final recipe of my Thanksgiving Week Extravaganza? 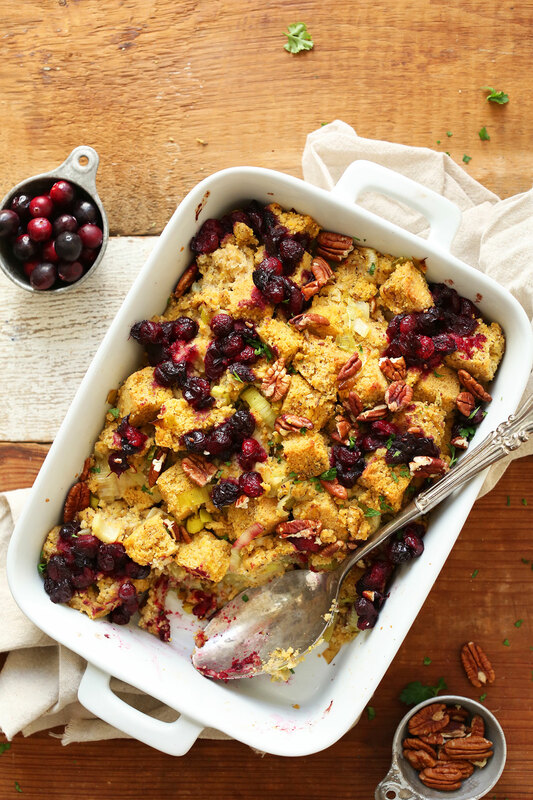 We’re going out with a bang with this wholesome, hearty, colorful stuffing. You may recall I have a Simple Vegan Stuffing with whole grain bread and lentils. That’s such a good one, too! But this one is sure to be more of a crowd pleaser because of the savory-sweet flavors, and that it’s gluten free optional! The base is a double batch of my Perfect Vegan Cornbread or my Best Vegan Gluten Free Cornbread. Having made it with both cornbreads, I must say I slightly prefer the Perfect Vegan Cornbread version because gluten is so damn delicious. But, both work well here! Next comes sautèed leeks and onions (celery is another nice optional addition), and simple 2-ingredient baked cranberries. The finishing touch is chopped pecans or walnuts for a bit of nuttiness and crunch. This side will complete your Thanksgiving spread and wow all your guests – I’m sure of it. And as a final recap, here are the 8 recipes I propose you make this holiday season! If you try this or any of the Thanksgiving Week Extravaganza recipes, be sure to leave a comment, rate them, and tag a photo #minimalistbaker on Instagram! We’d love to see what you serve up. Cheers and Happy Thanksgiving week, friends! 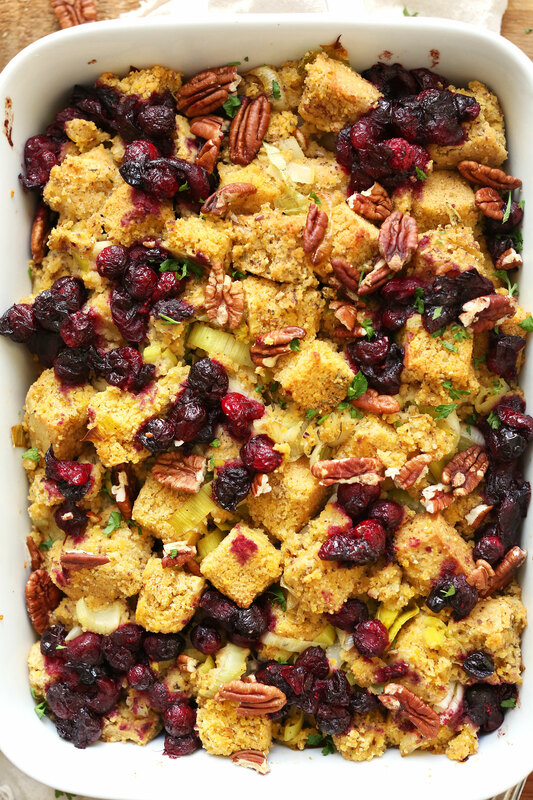 Savory, flavorful, tender cornbread stuffing with roasted cranberries, sautéed leeks and onions, and pecans. A healthier plant-based side for any occasion. Make your double batch (amount as original recipe is written // adjust if altering batch size) cornbread at least 1 day in advance so it can be cooled, cubed, and then left to dry at room temperature uncovered for 24 hours. This keeps the stuffing from becoming mushy, and allows the cornbread to absorb more of the vegetable broth. 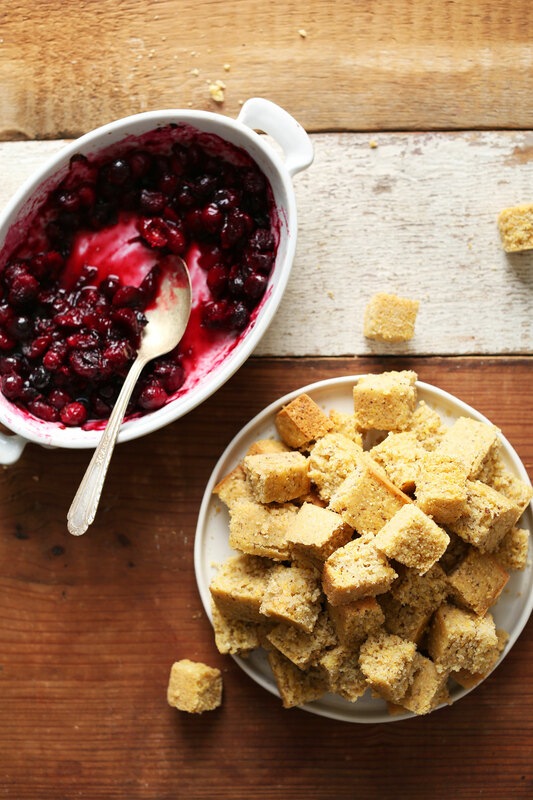 Once your cornbread has been dried, begin by preheating oven to 400 degrees F (204 C) and adding cranberries to a small baking dish. Top with water (or orange juice) and maple syrup. Toss to combine, then bake for 20 minutes, or until bubbly and soft. Set aside and reduce oven heat to 375 F (190 C). While cranberries are baking, heat a large skillet over medium heat. Once hot, add olive oil, onion, leeks and a healthy pinch of salt and black pepper. Sauté, stirring frequently, until soft and fragrant. Set aside. 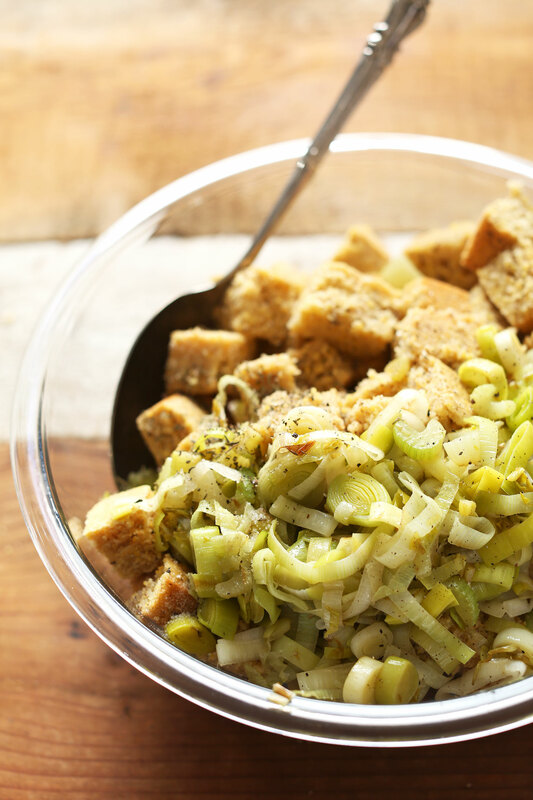 Add the dried cornbread to a large mixing bowl along with leeks, thyme, and pecans or walnuts (optional). Then add another healthy pinch each salt and black pepper and the vegetable broth, starting with half (1 cup or 240 ml as original recipe is written // adjust if altering batch size) and working your way up to 2, stirring gently as you go. You aren't looking to make a purée out of the mixture, but rather gently toss and incorporate the flavors. I found 2 cups (480 ml) to be the perfect amount (amount as original recipe is written // adjust if altering batch size). You want the cornbread to be moistened but not saturated. Add cranberries and gently stir once more (In the photos I added them at the very end, but after more testing found they get better incorporated when stirred in at this point). Transfer a greased 9x13-inch (or similar size // adjust number or amount if altering batch size) baking dish (like this one), and use a spoon or spatula to spread into an even layer. Cover with foil and bake 25 minutes, then uncover and bake another 30-40 minutes, or until golden brown. Let rest 5-10 minutes before serving. Leftovers store well in the refrigerator up to 5 days, though best when fresh. *Prep time reflects making and drying the cornbread, as well as making the stuffing. Cook time reflects cooking the cranberries, leeks and stuffing. Hey this was GREAT but I made a few additions and adjustments. It def needed way more than a pinch of salt! I’d say at least a teaspoon. I also added a nice amount of crumbled dried sage from my garden this summer and next time I would add celery along with the leeks and onion for a little more crunch! I brought this to my work thanksgiving party and it was a hit esp with all the non-vegans who didn’t/wouldn’t know the difference. Note: The less dried out your cornbread is, the less vegetable broth you need as well! Great recipe! This is outstanding. Made it yesterday for Thanksgiving. Added some chopped celery. Like others, I can’t stop picking at it even though I am full. The savory with the cooked cranberries is wonderful. Next time I will add chopped mushrooms. My cornbread didn’t get stale overnight so I threw it into the oven till it got crispy – that did the trick. 2 cups of broth looked like too much but was perfect. I just filed this in my Recipes I’ve Tried and Loved file. Thanks Dana! The vegan cornbread is the best I have ever had! I was so concerned when it was thin and lumpy like you said it should be. I resisted the urge to whisk and I am so grateful. Truly outstanding stuffing. Thank you. Very good recipe. Thank you for share! Hi! I plan to use this recipe to stuff a butternut squash. Usually I precook the squash and then add filing, but since you say to cook the stuffing for about an hour, would you recommend starting with an uncooked squash or still giving it a head start? Than you, I LOVE your recipes! SMART idea! I’d say mostly bake the squash, maybe until almost tender, then stuff it, then finish it off until VERY tender! Hope that helps! Minimalist baker does it again! I’m not even vegan and I love all the recipes. This one’s A++, I took the liberty of adding as much Rosemary as Thyme, and impressed with the results. Keep ’em coming! Saving this recipe so that I can make it on Christmas Day! I have a family member who is vegan so this will go down a treat as an alternative stuffing to go with the turkey! This looks so beautiful. I probably need to make an extra batch of cornbread to accommodate all the nibbling I would be doing while making this. Can this be made with dried cranberries and how? There are no fresh or canned to be found in my area ? Yes! Just put them in when I say to add the baked cranberries. I’d say about 1/2 cup. If I can only let the corn bread sit for 16 or so hours (I didn’t notice the 24 hour part until late) would that be okay? Or is there another way to dry them out? I just made this and it is absolutely the best. Mine does not look as pretty as yours but my husband can’t stop picking at it and we might not have any left for tomorrow. Great addition to our Gardein “turkey” rolls. Thank you for this. can I use dehydrated cranberries? That should work! I didn’t test it that way, but I’m guessing it will. Can this stuffing be put in the bird? Dishes are at a premium here. Hmm, I haven’t tried that. Can’t comment! Lives of animals are at a premium HERE. I can’t get this to print or Pin. The printer says it didn’t finish loading. Has anyone else had trouble? The recipe looks great. What an excellent combination of two amazing foods, well done! You are right, everyone loves cornbread. I have 2 families gatherings to attend where I try to bring at least 2 sides~ things get busy!!!! And I’m still hoping for time to do my hair and watch the Parade. Yeah, right. The cranberries gives just the right amount of color and the pecans make it superb. Big pecan fan here!!! They give you that pie feeling. I love your addition of cranberries. I made a test version of gf vegan cornbread stuffing yesterday and wondered about adding cranberries afterwards. I’m grateful that you’ve made it and verified that the flavors work. Your beautiful dish looks bright and fresh. This is how I like to eat AND what I’m bringing to share with relatives on Thanksgiving. Not all of my relatives are gluten free or vegan and this looks so yummy that no one will miss what is not included. Can’t wait try your recipe!